For at least five years, there’s been a battle among gun makers to see who can make the smallest, lightest, easiest to conceal 9mm handgun. Add to that list the DB9 pistol from Diamondback Firearms of Cocoa, Fla. I got my hands on a DB9 for a test and eval, and I’ve recorded my impressions below. The author’s sample DB9 from the left. 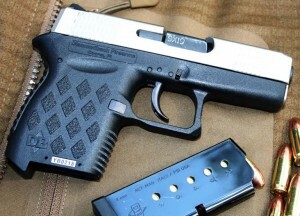 The latest subcompact 9mm to come down the pike looks a lot like a Glock 19 that was put under a shrink-ray. The two guns do share some similar qualities. Both employ black polymer frames and stainless steel slides, for instance. However, the comparison comes to an end there. The DB9 uses a double-action-only, striker-fired trigger mechanism that’s completely contained within the gun. (Diamondback calls it the ZERO-Energy system, and says the patent is pending.) No external hammer or firing pin is visible. As far as external controls are concerned, the DB9 has only two: the trigger and magazine release button. The gun was purposely built to be simple to operate and very thin. No slide lock or catch is present, and the DAO trigger negates the need for a mechanical safety lever. The DB9 measures only .80″ inches wide and 5.6″ long. The barrel measures a scant 3″ long. A six-round single column magazine feeds the pistol, and its empty weight comes to only 11 oz. Atop the slide you’ll find a rudimentary set of sights. The front sight blade has some white paint to make it easier to find. Diamondback put tiny white dots on the rear sight, but for the life of me I can’t imagine what useful purpose they might serve. My sample gun came with a silver stainless steel slide mated with a black frame. (The polymer frame is available in a variety of colors. Available slide finishes include black and stainless.) The grip features a raised diamond pattern for texture. On the slide, Diamondback has taken the time to machine forward and rear cocking serrations in a unique wave pattern, a nice touch. The base of the magazine includes a floorplate with a bit of a shelf for your ring finger to rest against. Your pinky finger will dangle. The author’s sample DB9 from the right. While the overall dimensions of the gun put it in running for most compact 9mm pistol on the market, the weight, or lack thereof, is what you notice when picking the gun up. 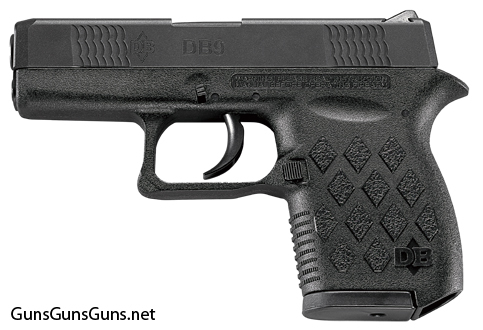 At 11 oz., the DB9 is definitely a 9mm featherweight. By comparison, the Kimber Solo 9mm weighs 17 oz. and holds six rounds in the magazine. The Ruger LC9 holds seven rounds in its mag and weighs 17 oz.. The S&W Shield, not a pocket gun, weighs 19 oz. and holds seven or eight rounds depending on the magazine. For my range time I took along Winchester USA 115-grain FMJ training loads and Federal 124-grain Hydra-Shok defensive fodder. Both are standard velocity loads. As you can imagine, Diamondback advises against firing +P or +P+ ammunition in the DB9. Here’s the reality of the matter: Firing an 11 oz. 9mm pistol, even with standard velocity ammunition, is an eye-opener. You feel it in your hands, and there’s no getting around that fact. It’s not going to kill you to shoot the gun, but I don’t see many people getting through a box of 50 rounds in a single range session. As for reliability, both of the aforementioned loads cycled the gun without issue in my hands. Keep in mind you need to lock your wrist when shooting a pistol, particularly one with such sharp, short slide stroke. Limp-wristing a pocket pistol like this is a sure path to a stoppage. In the accuracy department, I didn’t feel the need to stretch it out beyond 7 yards. Let’s be practical, folks: Pocket pistols are guns you carry as a backup or for when you don’t think you’ll need a gun. Using the base sights, I found 2″–3″ six shot clusters were indeed possible at 5 yards. If the shooter does their part, they should be able shoot a full magazine from seven yards into a group they can cover with the palm of their hand. Pocket guns are great for people who don’t like to carry guns. They’re compact and easy to carry; i.e., they require little modification of your normal mode of dress. Of course, the smaller the handgun, the more difficult it is to use effectively. Pocket-sized pistols have sharp recoil and only a small amount of surface area for the shooter to hold on to. In addition, the short sight and long trigger press amplify any shooter-induced errors. Small, light handguns require more dedicated training and practice than full-sized handguns. Unfortunately, far too many people who buy pocket pistols do so with very little regard to practice or training. Most are lucky to ever fire 50 rounds through their pocket blaster. Make your own choices, but I would rather practice and have as much confidence as possible with the tool I might need to save my life one day. The DB9 might not be the answer to all your personal defense needs, but it is one answer. Note: Diamondback Firearms also produces direct relatives of the DB9 chambered in .380 ACP (the DB380) and .32 NAA (the DB320). The DB9 with the black slide. This entry was posted in $251-$500, 9mm, Diamondback Firearms, Semiauto, Subcompact and tagged Handgun Reviews on November 9, 2012 by Paul Markel. This pistol has received mixed reviews but appears to be getting better over time. I have one with EXO slide and love it. Mine is reliable and shoots well. As others have said, it is “snappy” and is incredibly small. I have had a good experience with it and carry it daily. After receiving my CCW permit, I decided I wanted a smaller pistol to carry everyday than my Glock 23,so I bought a DB9 for $349 at my local gun shop. My first trip to the range with the Diamondback resulted in several malfunctions due to the 147 grain ammo I was using. Fist problem was the manual that came with the DB9 didn’t say anything about the recommended bullet weight for this pistol, it only said not to use +P ammo. I had to go to their website to read that the maximum bullet weight was 124 grains. After buying some 115 gr FMJ ammo, my results weren’t much better. I still had several malfunctions, but I was also having a problem with the pistol hitting way below the point of aim. After contacting Diamondback about the sights, they responded by telling me that the sight picture that was shown in their manual was changed in their newer manual. The picture they emailed me showed that half of the front sight needed to be held above the rear site to correct the problem. What a joke! Besides the pistol not being reliable enough for conceal carry, having to modify my point of aim wasn’t going to work for me. 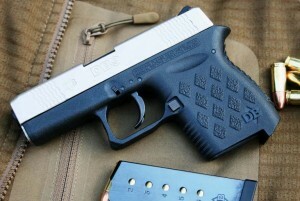 I soon traded the DB9 back to the dealer and he ordered me a Kahr CM9 to replace it. I couldn’t be happier with the CM9. 100% reliable, hit to the point of aim, no ammo restrictions and all for $356! I have 2 Diamondbacks – DB9 and DB380EXO. The DB9 was my first and I enjoy shooting it so much that I bought the DB380 with the EXO coating. Looking forward to shooting it when I can find some ammo. I bought my DB9 2 weeks ago and shot 50 rounds thru it my first time out. After adjusting the rear sight to suit me I was shot 6 rds in 2″ groups 6 times at 10 yards. I like it a lot. I have a DB9 EXO & love it. I also have a Kahr CM9. The Kahr is the easier shooter, both are very accurate and reliable, but the DB9 is really small! There is a huge difference in size! Weight and cc between the two pistols that the specs don’t capture. When I needed to give my son-in-law a pistol, he got the Kahr and I kept the DB9. Both are great pistols but for everyday concealed carry, the DB9 is the clear winner. I bought my DB9 about 6 months ago. Have had a couple of load issues but was told my trigger pull is the problem. Also, I did not know about locking the wrist. What does that mean? I want to use a LaserLyte 9 mm cartridge. Without a slide stop, how can I use that….how can I get it in/out? I like shooting it and want to use this gun for carry. I think they should have put a slide stop on it….that can’t add hardly any weight or width to speak of. He states that, “he doesn’t see many people making it through 50 rounds in a single range session”. That is really overstaing it. I put 100 rounds through it right out of the box…it’s not that bad..
Works well — WHEN you hold it correctly. Yeah, can’t agree more with the author on that and shooting a box of ammo (for most of us) at the range. I found that the feed ramp has to be kept clean (short and steep relative to full size guns). I am currently shooting Federal hollow points, but found a new load from Remington for the short barreled 9mm that has a more FMJ shape to it. I have yet to try it, but the shape should help with the margin of error in feeding. So locking you wrist can probably be answered better by others but it means to not allow your wrist to flip/move up when you fire. Why? ALL semi autos function by the slide recoiling (thus extracting a round, cocking the hammer, feeding a new cartridge into the chamber). If you allow your wrist to give, you will rob the process of energy, usually leading to failure to feed (jamming). The round is either partly up the feed ramp, or it is sticking up semi-vertically in front of the chamber (stove piping). In either case you now have an opportunity to practice your clearing technique. I did this when I got my 1911 many years ago. Though there were additional problems, the main one was that it was very comfortable to just let it flip up and pop back on target. But the jams were many. A friend observed me and called me on it. In such short guns as the DB9, with very short and steep feed ramps, any error here is magnified. Your training deficiencies on a large gun will be greatly magnified in a pocket pistol. Hence the author pointing out trigger stroke being relatively long (the affects of poor placement of your trigger finger will show up). Is it a hard gun to shoot? No. But reliability of a follow up shot is dependent on PROPER shooting skills. And of course confirming you have the mechanically correct ammo (bullet ogave shape). You do put your pistols through at least 200 rounds? !